Since my arm worked out, I figured I'd post a little tutorial/walk through of how I made it. Now, it is not screen accurate! It's as close as I could make it, but I messed up a few details, and couldn't find certain parts. I accidentally made mine with three fingers, cause my main reference image only showed three. There are actually four. That's my main mess up. Everything is else is just a minor detail. So, start by getting yourself a bunch of reference images! This is the main image I used, with a bunch of others supplementing for different angles. I actually went and saw Mad Max a second time, and that's when I realized I missed a finger. None of my reference images clearly show four fingers. I used a strechy black fabric I had on hand. Make sure when you draft your pattern you leave enough room for a seam. Cut out two of each piece. With right sides together, sew the fingers (leaving opening at bottom) and base (leaving opening for fingers). Next, turn fingers right side out. Put inside finger hole (base inside out), much like you would sew a sleeve, and pin in place. Hand stitch. Your glove is now done. I would recommend using a fabric that doesn't fray. Now, for this next part, you just have to sketch and see what works. I put my glove down, then used wax paper over it to draw out the metal plates. Cut out. Test. If they work, cut out of foam. Test (I use tape to keep it together). If it still works, cover in worbla. I decided for the bottom two pieces (near the wrist) to cover them together since they look close in the pic. The top piece, and finger pieces are all covered separately. Finger pieces are worbla only, no foam. Do the same for the bottom (palm). Cut out finger backs. Reminder, for the fingers, I used straight worbla, without a foam base. For the metal mesh look, I bought sink strainers (the small kind to catch stuff from going down the drain) and took them apart. Trace out pattern, cut, "sew" together using metal wire. Wrap sharp ends in tape, cover in worbla. For the thumb, I bought a kids tool set and tore the pliers apart, then used instamorph to build it up. Attach using hot glue (might be a good idea to paint it first. I didn't though.) Next, use the reference image to mark out where to drill holes for the string laced through the back of the hand. Drill. Using air dry clay (I used sculptee), sculpt the finger prongs (forgot to image this part). I scultped mine right onto the wire mesh. Use foam to cover the bottom of the other finger. Paint a few layers of gesso (to smooth). Make sure to only paint the parts needed (exclude black foam, wire mesh). Paint a base coat of steel gray, in a swirly motion. Don't just brush up and down. Do two coats. Next, use brushed pewter in a dry brush technique to weather. Weather with black as well. Your base is now done. Part two will be adding details. I'm making one for my prop collection and will be loaning it to a friend for her Furiosa cosplay for DragonCon. Thank you Joshua Craig for commenting! 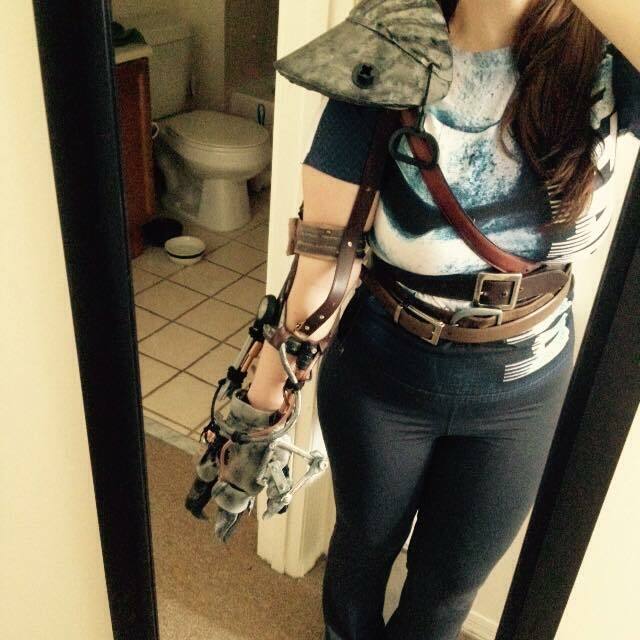 Just an update, after wearing to SuperCon, the arm does get very heavy. My hand was slightly swollen and tingly after for an hour or two. And I was unable to bend my fingers for that time as well. I'm currently trying to remake it using nothing but foam and if it works, I'll post a secondary tutorial. Hope your builds go well and I'd love to see pictures! Thanks for this tutorial. This could be really useful for me. Thanks for commenting! See my above reply for a little update about the arm. Good luck on your build and I'd love to see pictures! Thanks for the tutorial. I like very much !!! Good Job ! !